Platelet donation is the process of extracting platelets from the blood of donors through a special procedure called “apheresis”. Platelets have a key role in stopping or preventing bleeding. Platelets can only be stored for a few days, so platelet donors are asked to attend at least 8 – 10 times per year, up to a maximum of 24 times a year with a minimum interval between donations of 14 days. A cuff is placed around your arm, the skin cleaned, local anaesthetic may be injected and the donation needle inserted. Blood samples are taken at this stage for testing in the same way as whole blood donations. Additional tests carried out for platelet donors including checking your platelet count and determining your tissue type (so that your platelets can be matched to those of a particular patient if needed). While you are donating you will be monitored and cared for by qualified staff supervised by nurses. You can read, chat to the staff or relax and you will be offered refreshments. When the procedure is completed the needle will be removed and a dressing applied to the venepuncture site. Eligibility criteria in terms of age and health are the same for blood and platelet donors, but for platelet donation but your height and weight ratio has to be assessed to check your blood volume. There is one additional medication rule: you cannot donate platelets if you have taken aspirin, aspirin-containing medications, piroxicam or nonsteroidal anti-inflammatory drugs, such as Ibuprofen in the last 48 hours. This is because these drugs affect the potency and performance of your platelets. 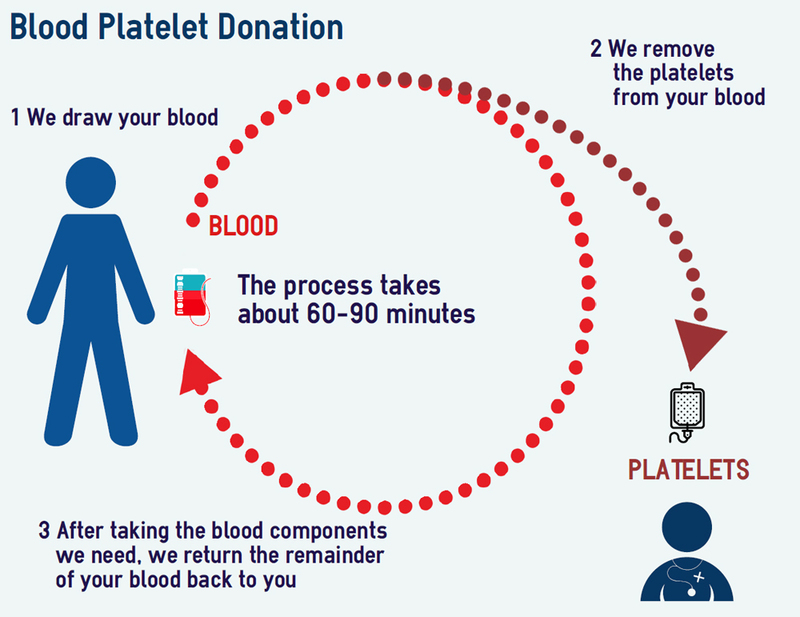 Selected platelet donations – why are you special? Your ’tissue type’ is also known as your HLA type. It is one of the ways that your body’s defence system identifies the differences between your own cells and foreign cells. What is HLA (Human Leucocyte Antigen)? Antigens are proteins, often found on the surface of cells. Antibodies are formed by the body when it recognises a ‘foreign’ antigen. This is part of the body’s defence mechanism against ‘foreign invaders’. These antibodies will destroy ‘foreign’ antigens and the cells they are on. The surface of almost all cells including white blood cells and platelets (but not red cells) carry a set of antigens called Human Leucocyte Antigens (HLA). Who needs selected (HLA matched) platelet donations? Patients who require multiple platelet transfusions, such as people with leukaemia, those on long term chemotherapy or with platelet disorders, may develop antibodies to platelets that have different tissue types (HLA) to their own. This means that the patient’s antibodies will destroy any platelets that are different from their own, as a consequence the platelet transfusion is ‘rejected’ and the transfused platelets are destroyed. When a patient has developed HLA antibodies, we have to select donors who have an HLA type that matches the patient’s own HLA type and that is not seen as ‘foreign’ to the patients immune system. Not everybody develops antibodies and the reasons why this happens are not always understood but patients who receive more platelet transfusions are more likely to develop antibodies. The majority of patients don’t have antibodies that destroy platelets and so don’t need to be matched. Why is HLA type important? If a patient makes antibodies to an HLA type then platelets have to be selected (or matched) so they are similar to the patients HLA so the antibodies will not recognise them as foreign. If the transfusion isn’t matched then the platelets will be destroyed by the patient’s antibodies before they have a chance to work by stopping or preventing bleeding. The majority of people have 4 different HLA antigens which make up the tissue type on their platelet but some people have only 2 or 3 antigens. Platelets from donors with 2 or 3 antigens will match many more patients than those with 4 antigens. These donors are called “homozygous” and because they match many more patients they are called “high-value” donors. HLA selected platelets from homozygous donors are less likely to trigger antibody production after transfusion, or be attacked by antibodies that already exist in the patient. Why is homozygous “high value”? If you are found to be either homozygous then your donations are extremely useful for certain patients. It has no implication to you directly as everybody has an HLA type. We just wanted you to know how your donations are especially needed. We hope you are able to continue donating as an apheresis platelet donor as often as you are able. Further information can be found at the NHSBT or by clicking here. Click here to find out how to become a platelet donor. Platelets given by generous and committed donors are often life-saving and special in that they can help up to 3 adults or even 12 children.